Eight years ago Anne Elliot was engaged to Frederick Wentworth, but broke it off because her friend Lady Russell disapproved. She has regretted it ever since. Anne's family in the meantime has come into financial difficulties, and they are forced to leave Kellynch Hall and rent it out. When the new tenants arrive, it turns out the wife is none other than Captain Wentworth's sister, and soon Wentworth himself returns to the area. But there are many single ladies also hoping to make a good marriage and Captain Wentworth seems to pay little attention to Anne. After waiting so long, will Anne finally be united with the man she loves, or is it time to finally give up all hope and move on? I liked Anne Elliot as much for her vulnerabilities as for her strengths. Like Pride and Prejudice's Elizabeth Bennet, she would not settle for a man just because he was interested in her if she was unable to respect him. But when it came to the man she really did love, her insecurities came to the fore. Already 27, Anne knew she was past her prime (!) and not as attractive as she once was. Yet she felt she was still essentially the same (probably much like my 40-year-old self is convinced I'm just the same as when I was 25.) Every time she was around Captain Wentworth she tried to gauge his reaction to her and to the other, younger women around them. She wasn't pining away pathetically; she just knew that ending their relationship so many years ago was a bad choice and hoped he knew that too. There is much more romantic intrigue than just the non-relationship between Anne and Captain Wentworth. A friend of Elizabeth Elliot's is trying to insinuate herself into the good favor of their widowed father. The intriguing Captain Benwick is still mourning the death of his fiance. Anne's cousin William Elliot also returned after years of estrangement, and was clearly seeking out a love interest. In addition to Anne, eligible young ladies included those of the family that Anne's sister Mary married into, the Musgroves. There were enough characters of both sexes to keep me wondering who would end up with whom, without getting everybody confused. I can't figure out what is so satisfying about Jane Austen's books (of which I have only read two so far.) I love being immersed in this world, though I certainly wouldn't want to live it. The social obligations alone would do me in, but the utter boredom that these people must feel sometimes could not be borne, I don't think. None of them have jobs or careers, and the young women occupy themselves only with gossip and the hopes of someday being married and having children, presumably just to give them something to do. How could they stand it? And yet. To have so few responsibilities, so much time to think, seems positively luxurious sometimes. This was a difficult book to listen to, though not through the fault of the wonderful narrator, Juliet Stevenson. Austen's sentence constructions can be tough to follow out loud, but it was so good that I didn't mind skipping back to listening to bits of it over again when needed. I did that a lot. I also grabbed a paperback copy from the library and read parts of it after listening to make sure I didn't miss anything. I might read this again, or listen to it again. I don't know what it is about Jane Austen that bears so much repetition, but I likely won't grow tired of this story just as I haven't grown tired of the BBC production of Pride & Prejudice which, despite the 5-hour length, I have watched over and over again. 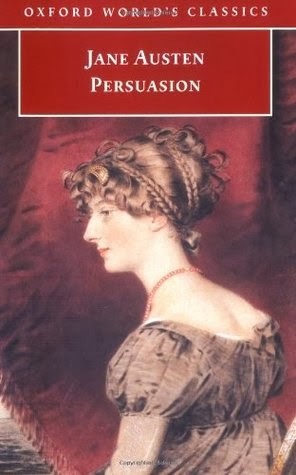 I will look for this narrator again, especially if I decide to listen to another of Austen's books. I'll certainly be consuming more of her work in some form or another. Austen fans, which title do you recommend I try next?